This year all levels of science enthusiast, from school pupils to Professors, filled Imperial College’s Great Hall for an evening of science entertainment. We were treated to lectures from leading women in bioengineering, geology, neuroscience, molecular membrane biology and politics interspersed with hydrogen bottle rockets, flying lizards drawn in BBC Basic and a cryogenically themed love song. It all added up to a perfect mix of comedy, inspiration and cutting edge science. Thanks to support from the Biochemical Society, we were able this year to have the event photographed, and you can see all the photos in this Flickr set. Huge thanks to Paul Clarke for doing such a fantastic job. Please note that all the photographs have been licensed under a Creative Commons licence which allows for commercial reuse with attribution. If you would like to use any of these images, please do, but please give attribution to both Paul Clarke and Ada Lovelace Day, and a link to both sites would be appreciated! This year, we were also given enough budget for video. Thanks to Juggernaut.tv for doing a superb filming and editing job. Below you’ll find the highlights reel, and the full presentations of seven of our speakers. Please do feel free to embed these videos wherever you like, but please do give credits to Juggernaut.tv and Ada Lovelace Day, with links to both sites if possible. If you would like to reuse these videos for commercial purposes or to remix them, please get in touch. Highlights from Ada Lovelace Day Live, 15 October 2013. 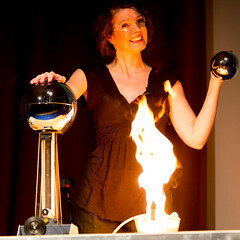 Fran Scott, a science communicator who designs demos for CBBC, live stage shows and the Science Museum. Prof Sophie Scott, a cognitive neuroscientist and standup scientist who studies laughter, from brain scanners to comedy clubs. Hazel Gibson, a geologist studying how geological processes affect our lives, and who is out to prove that women and geology is a combination that rocks! Chi Onwurah, engineer, MP for Newcastle, and Shadow Cabinet Office Minister with responsibility for cybersecurity talks about her engineering career and women in engineering. Leila Johnston, a comedy writer, technologist, maker and broadcaster who encourages us to ‘do things we’re not supposed to’. Dr Bernadette Byrne, a molecular membrane biology researcher at Imperial College London, who is exploring the science of our own cells. Helen Arney, comedian and geek songstress, and the producer of Ada Lovelace Day Live since 2010.